Nigel Melville was an outstanding scrum-half who was limited to 13 international caps by a series of serious injuries which eventually forced him to retire at the age of 27. He joined a small club when he captained England on his debut in 1984 at the age of 23, but neck and shoulder injuries, as well a series of knee operations curtailed his progress. He returned after almost two years out of the side for the start of the 1988 Five Nations, taking over the captaincy for the last two matches. He led them to a gritty win at Murrayfield, but a few minutes into the Ireland game he suffered a broken leg which was to end his career. He moved into coaching, and as director of rugby at his old club Wasps, he guided them to the Premiership title in 1996 and then two cup final triumphs. In 2002 he moved to Gloucester where he achieved further honours before he stood down in 2005. 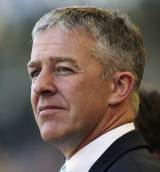 In 2006 he became CEO and president of rugby operations for USA Rugby.